One of the best ways to experience Bermuda is to spend the day on a sport fishing charter. Our beautiful turquoise waters offer some of the most exciting sport fishing in the Atlantic. A charter on the Overproof with Captain Peter Rans is a must during your vacation. You will spend the day on a fishing machine with an experienced captain and mate hunting the 'Big One' be it a Blue Marlin, Tuna or Wahoo!! You will also find White Marlin, Yellowfin Tuna, Bonita, Amberjack and Barracuda to be plentiful. OVERPROOF clients have enthusiastically caught Marlin that were in excess of 700lbs (our biggest being 906lbs). Bermuda Sport Fishing Captain Captain Peter Rans is the owner and captain of OVERPROOF. He has been deep sea fishing in Bermuda since he was a young boy and is extremely knowledgeable and successful when it comes to fishing Bermuda waters. Peter has also fished in the Australia, Bahamas, Costa Rica and the Southeast U.S. In 2002, Peter caught the largest blue marlin (906 lbs) and the largest wahoo (102 lbs) of the season. He placed 4th in the 2002 and 2003 Bermuda Big Game Classic and 3rd Place in 2005 with an 850lb Blue Marlin! He has won the Bermuda International Light Tackle Tournament in 2006 and 2003. He won the Bermuda Triangle Billfish Tournament in 2007 and placed 2nd in the Seahorse Anglers Billfish Tournament in 2008. The Captain Captain Peter Rans is the owner and captain of OVERPROOF. He has been deep sea fishing in Bermuda since he was a young boy and is extremely knowledgeable and successful when it comes to fishing Bermuda waters. Peter has also fished in the Australia, Bahamas, Costa Rica and the Southeast U.S. The Boat OVERPROOF is a 2005 42 foot Wilson Boatworks, Custom Carolina vessel. OVERPROOF is fast, powered by twin 480 Cummins and she handles the seas well. There is a comfortable seating and dining area in the salon with an open back that allows you to be part of the action in the cockpit. The cockpits is wide with a 14.5foot beam and a Bluewater Yachts fighting chair and two very large under deck fish boxes. The cabin is air-conditioned and has two comfortable berths and bathroom facilities. Because of her speed, we can get you out to the fishing grounds in less than a 1/2 hour so that you can have maximum fishing time. In addition to her experienced Captain, the other advantage you will have over the fish is the latest in deep sea fishing electronics and top shelf tournament tackle, we use Alutecnos and Shimano Tiagra reels. You will fish in comfort and style on the OVERPROOF. 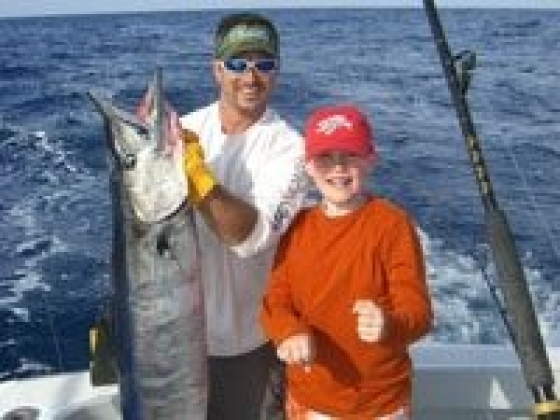 Bermuda Sport Fishing Rates We offer the BEST rates on the Island among Bermuda's top sport fishing charter boats. Strictly Marlin Fishing - $1600 8 hours for up to 6 people. Full Day - $1400 8 hours for up to 6 people. 3/4 Day - $1200 6 hours for up to 6 people. Half Day - $1000 4 hours for up to 6 people. Other things to note: A 50% deposit is required at time of booking. OVERPROOF Charter Fishing has the right to cancel the trip due to unfavourable weather conditions in this case your trip can be rebooked or we will refund your deposit. If you need to cancel your trip you must give 30 days advance notice to receive a refund of your deposit. It is customary to tip the mate 10% to 15% at the end of the day based on your satisfaction of his service. The "catch" is usually the property of the Boat, however, Peter will give some fish to the charter to take home and enjoy a fresh fish dinner. A fishing charter on the OVERPROOF is a MUST during your vacation to Bermuda.